Description: Slender shrub 2–4 m high; branches divaricate, often spinescent; branchlets pubescent. 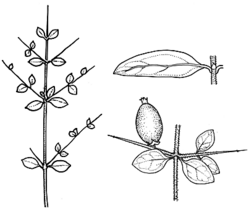 Leaves crowded, variable, narrow-ovate to obovate or elliptic to lanceolate, 0.5–1.5 cm long, 2–5 mm wide, apex obtuse to subacute, lamina glabrous, venation reticulate; shortly petiolate; stipules obtuse, cuspidate. Flowers solitary, terminal on axillary branchlets. Male flowers with calyx cup-shaped; corolla funnel-shaped, c. 3 mm long, lobes longer than tube. Female flowers with calyx well-developed; corolla tubular c. 3–4 mm long, lobes longer than tube, recurved. Drupe oblong, c. 5 mm long, red, crowned by persistent calyx lobes. Distribution and occurrence: Grows in damp sites in woodland, sclerophyll forest and cool-temperate rainforest, usually along creeks; south from Dorrigo.